Several weeks ago, I wrote about share buybacks. I pointed out that management’s job is to allocate capital. It does this by reinvesting in the business, making acquisitions, rewarding shareholders or doing nothing. That’s it. There are no other uses for cash in a business. Corporations are taxpayers and job creators. They are also unloved and often demonized. In particular, some object to massive share buybacks, which they view as anti-employee. However, given the alternatives, I concluded that rewarding shareholders with buybacks and dividends is the best choice. Now, I want to explain why the other choices — acquisitions and investments — both destroy wealth. First, let’s look at acquisitions. 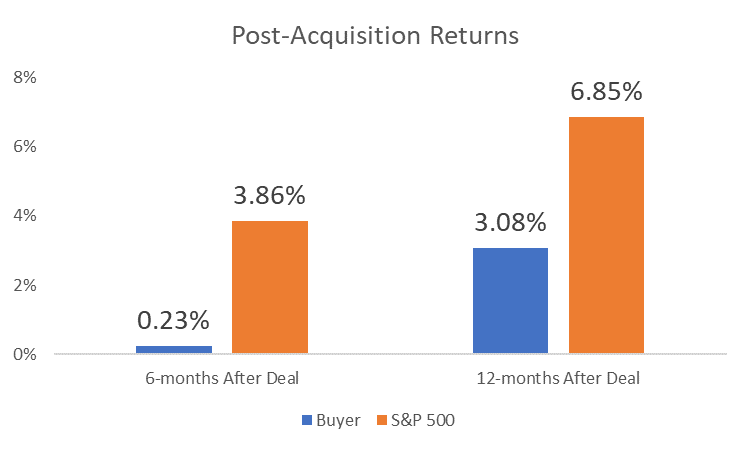 A recent study looked at returns after large deals are completed. There were 1,264 acquisitions worth at least $500 million since 1998. Stock market returns six and 12 months after the acquisition are in the chart below. The results are clear. Large acquisitions don’t add value in the first year. The data also shows investors don’t believe acquisitions will help in the long term. Stock prices are forward looking. Current prices reflect what investors believe a company is worth based on future performance. First-year returns indicate investors believe companies completing acquisitions will deliver below-average results in the future. When management reinvests in the business, there’s a built-in conflict of interest. It’s known as the principal-agent problem. The problem is that shareholders empower managers to make decisions, but they can’t force managers to act in the shareholders’ best interest. Managers focus on the short run. Investors focus on the long run. New investments need to deliver almost immediate results to benefit managers. But the projects often fail in the long run. Now, if I told you this happened in government work, you wouldn’t be surprised. If I want to build a road, I might make assumptions to project a low cost. After the project starts, I will revise the estimates higher. And since I already started the project, the government agency will pay. It’s easy to understand the problem in these terms. The same problem exists in large companies. Picture the problem with a company like General Electric Co. (NYSE: GE). Over the past 10 years, management invested more than $403 billion in capital projects. These projects include initiatives like new factories or equipment upgrades. Over that same time, the market capitalization of the stock fell by more than $250 billion. In other words, GE’s managers spent $403 billion to destroy $250 billion in wealth. Clearly shareholders would be better off if management increased the dividend. In addition to examples like GE, there’s also research on stock prices showing the impact of the problem. On average, companies that invest the most deliver the worst returns in the long run. One study reviewed data over 40 years. It found companies that invested the least outperformed the companies with the largest investment by an average of 20% a year. These are averages. Some companies invest wisely. Many don’t. There’s no simple answer. But, on average, buybacks and dividends create the most wealth.